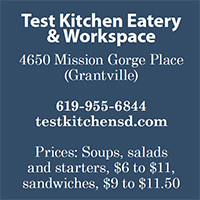 Just outside the fast-food jungle that is Mission Gorge Road — down toward Interstate 8 — is a winding office park housing an unexpected find: Test Kitchen Eatery & Workspace. The operation is located on Mission Gorge Place, a street I’ve driven past for years without ever noticing. Yet for the restaurant group, BBG Cal, which operates a small constellation of New Zealand-inspired restaurants throughout San Diego, the street is home to an industrial kitchen where recipes are tested whenever chefs within the group conceive of new dishes. It is also where things like lamb pies and turkey chili are constructed and sent out to all of the restaurants, which include Bare Back Grill in Pacific Beach; Queenstown Public House in Little Italy; and Dunedin in North Park. 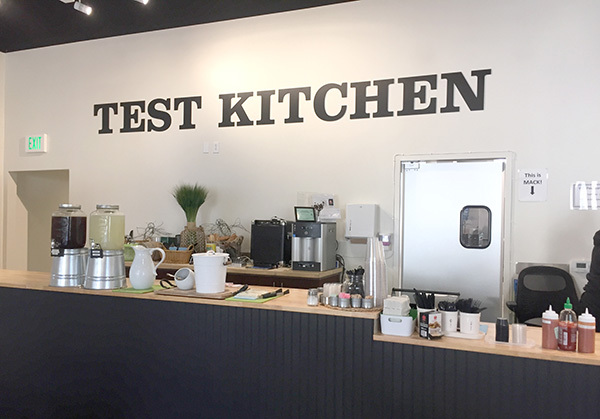 Even better is that Test Kitchen is fronted by a bright, airy cafe that serves lunch Monday through Friday. Upon walking in, you’re suddenly transported into what could be a trendy eatery in some other neighborhood. The warm-industrial atmosphere features high ceilings, pendant lighting and blonde-wood tabletops. There’s also a faux vegetable garden set along a cleverly designed menu wall flaunting hanging clipboards instead of a common chalkboard. Hearty sandwiches served with potato chips dominate the bill of fare, along with a few salads, tomato-basil soup and a “protein platter” of hummus and hard-boiled egg. There is also a chicken quesadilla, and the aforementioned turkey chili, which you’ll be remiss to pass up. 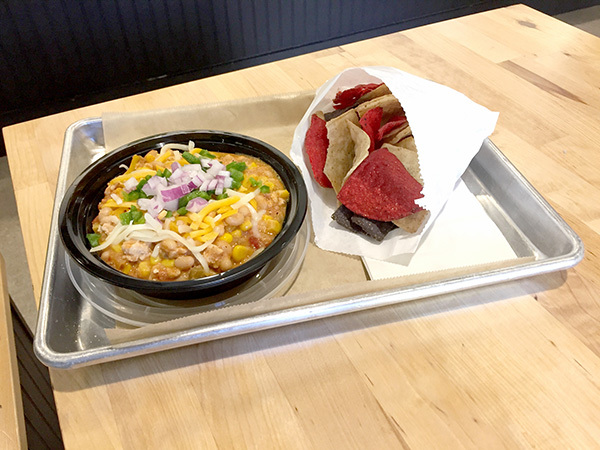 The chili combines ground turkey with small, tender white beans, diced red onions and fresh jalapenos. Lurking in the recipe are pinches of cayenne pepper, which makes the dish deliciously outgoing without being too spicy. It’s served with tri-colored tortilla chips that you break apart and sprinkle over the top for added texture. Mack Forrest is the cheerful front-of-the-house manager who warmly greets customers with a wealth of knowledge about the menu and operation. He seemingly knows everyone who saunters through the door — whether they’re dining in or claiming to-go orders. 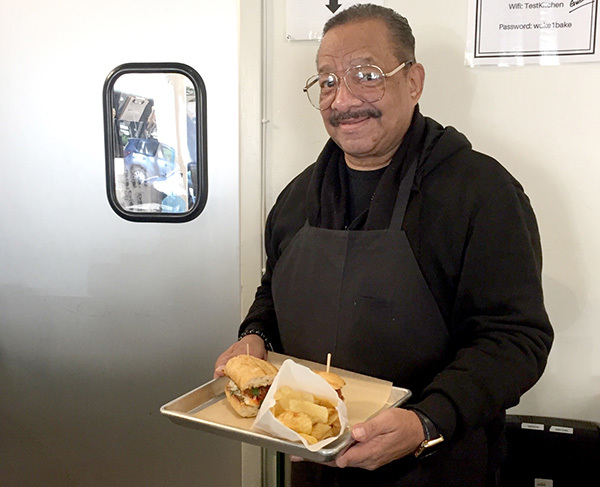 Such a devoted employee, there’s a sign hanging on the wall behind the order counter he faithfully occupies stating: “This is Mack.” It contains an arrow pointing to where you’ll usually find him stationed when he isn’t delivering food to customers’ tables. His enthusiasm over a recently tweaked tuna sandwich called “The Nina” led me into ordering it. In addition, my hankering for red meat was sated with beef-pork meatballs tucked into a French roll with melted mozzarella and house-made marinara sauce. It had all the characteristics of any meatball hoagie, but with the bonus of a roll that was extra buttery and infused with a distinctive grill flavor. 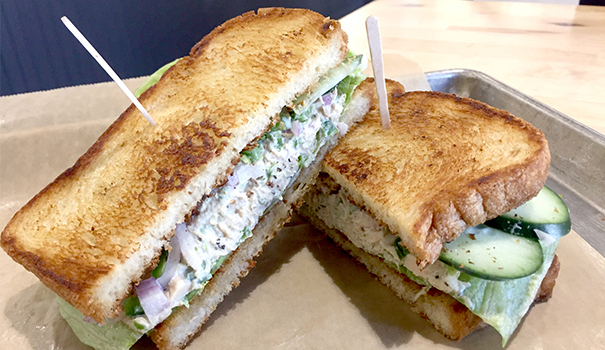 The surprise in the albacore tuna sandwich was jalapeno mayo, which Forrest says was recently added into the scheme along with sliced cucumbers. Layered generously between grilled white bread along with crisp lettuce and diced jalapenos, this isn’t the boring tuna sandwich common to school lunch boxes. Its zesty quality proves that fish and spicy chilies strike happy matches, at least with seafood as strong-tasting as tuna. A lengthy front counter serves as the condiment bar. It’s also where you’ll find self-serve dispensers of lemonade and mint-infused sun tea. Forrest makes each of them in the mornings before opening, and his attention to detail becomes apparent when you encounter a filled ice bucket and neatly cut lemons parked alongside the cups. It should be noted that proteins such as ham, turkey breast and roast beef used in a variety of other sandwiches are in the form of cold-cuts, which Test Kitchen outsources. The meats are not roasted and sliced onsite as some might suspect. But they’re put to hearty use in combinations that extend such sandwiches as turkey-bacon-avocado with mozzarella; ham, bacon and Swiss cheese with Dijonnaise; and roast beef with blue cheese crumbles, pepperoncini and horseradish aioli. Other options include a Buffalo-style chicken sandwich kicked up with red onions, blue cheese and pepper ranch, plus the Frisco club combining turkey, bacon and ham with lettuce, tomato and mayo on sourdough. 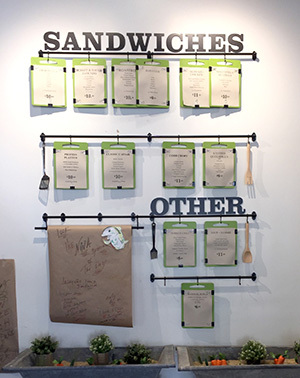 Forrest says new sandwiches for Test Kitchen’s menu materialize “about twice a month.” If not, then small tweaks are made to existing sandwiches. One of the workplace perks at Test Kitchen is that everyone on staff gets to evaluate new dishes that any or all of BBG Cal’s chefs introduce on behalf of their respective restaurants. Those items range from appetizers and salads to entrees and desserts. “It’s a team effort. And I can say that I love my job,” Forrest added.